Homeschooling is our way of life, but that doesn’t mean we do all our learning at home. It also doesn’t mean I do all the teaching. What it does mean is that home is the central part of the hub of my children’s education. With no c0-ops available with families I know and trust, I thought this year meant no godly teachers from outside our home. I was wrong. God brought three, but today, I’m sharing on the one literally sewing. Sowing into my children’s lives via sewing. Right then and there a prayer request and desire of my heart was answered. I have been wanting to teach my girls to sew and they have been requesting (or begging, whatever), but… well… sewing is not my gig. Actually, that’s putting it nicely. Sewing makes me very unhappy, makes me break out in hives, and often leaves me feeling like an idiot (even worse than sugar cookies). None of those things equate to lovely sewing time with mother. Yet… God brought a way. He brought Edie and her willingness to spend time with my family. 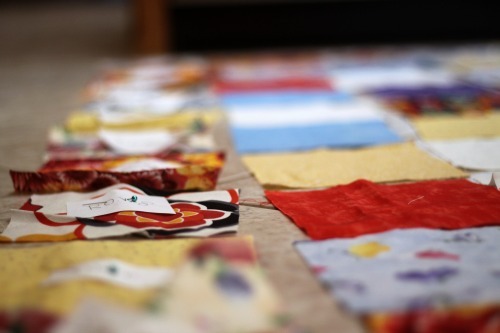 So… or sew, as the case may be, Edie has been coming for a month of Mondays now for quilting class. 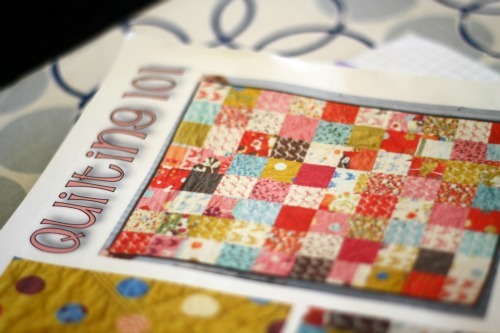 Quilting class. In my home. With my girls. We are all loving it (even Edie, thankfully) and I am very proud to see the quilts forming. Each of the girls’ personalities are not only reflected in the material they chose from Edie’s scraps, but in how they go about their tasks. I am able to do the basics as an assistant because Edie is there to lead (and keep me from panicking). If I had not been willing to ask someone for help, my girls may never have put their hands to fabric. If I had not been willing to allow someone else to teach my kids, my girls may never have had their request answered. If I had not been willing to step outside my comfort zone, my girls may never have this precious time with a godly woman, with their mama, and with their sisters. Homeschooling moms, don’t box yourself and your children inside your home or your abilities due to fear (of sewing or bigger things), pride, or lack of initiative. We are to teach our children, yes, but not only academics. We are to teach them many other important lessons. We are all created differently. Edie has something I don’t have. There is nothing wrong with that. It’s how life is. Allowing Edie to share her gift is a very good thing and it encourages me children to admit their weaknesses. We can learn from godly people outside our family. Edie loves the LORD. She is another light for Christ. By allowing her to come and invest in my children, I am encouraging them to learn from another Christian. We may sacrifice for one another. My girlies know that this class is a stretch for me. Now they also know that I was willing to be stretched and find a solution for their request. I’m so grateful God led this whole gig. So are my girls. How can you step outside your comfort zone to bless your children?